Lot of 2 Team USA vs USSR exhibition hockey ticket stubs from the Dec. 20 1989 and Jan. 5 1992 games played in Dallas. 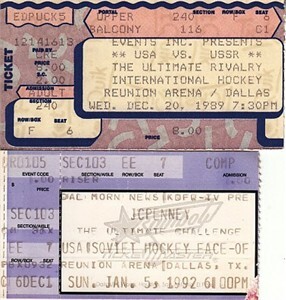 The 1992 game featured the U.S. Olympic Team led by Keith Tkachuk that finished 4th in Albertville. ONLY ONE LOT AVAILABLE FOR SALE.